Learning a complicated software program, like Photoshop, is similar to learning a foreign language. Photoshop can do virtually any image editing task you want. But how do you communicate your intentions? You learn how to Speak Photoshop! Written by industry expert and technical college graphic design instructor David Bate, Speaking Photoshop guides you through the complexities of Photoshop, giving you important insight as to how and why the program works the way it does. Armed with this knowledge, when you begin to work on your own images, you’ll be able to make an intelligent decision as to which tool or method will produce the best results. All of the image files used in the book are available on this website under the Chapter Files link. 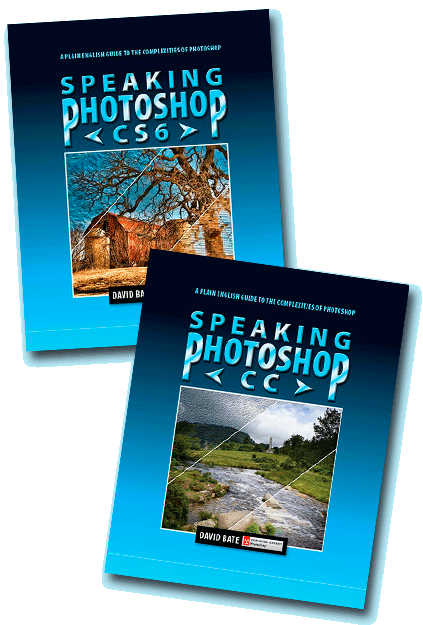 For school applications, or for those who simply want to excel through additional practice, check out the Speaking Photoshop Workbook. It contains chapter questions and additional projects that let you practice and solidify your newly attained Photoshop skills. Answer keys, grading rubrics, a midterm, and a final are available at no cost to teachers. See the Workbook link for details.